Over the last few decades, African elephant populations in Chad's Zakouma National Park went from thriving to just barely clinging to existence. But now, after three years of intensive anti-poaching strategies, the region's elephants population is finally on the rise. Park officials say that as poaching rates spiked between 2005 and 2010, reducing their numbers from 4,000 to just 450, the surviving herd members failed to breed regularly due to stress. The few calves that were born during this time became poaching's secondary victims, left orphaned and without defense against predators. In late 2010, the park implemented a new plan to protect its most threatened inhabitants from poachers, deploying year-round patrols. This included aerial support and fitting elephants with satellite collars to track their location. Thanks to these added measures, not a single elephant has been hunted in Zakouma in over two years. 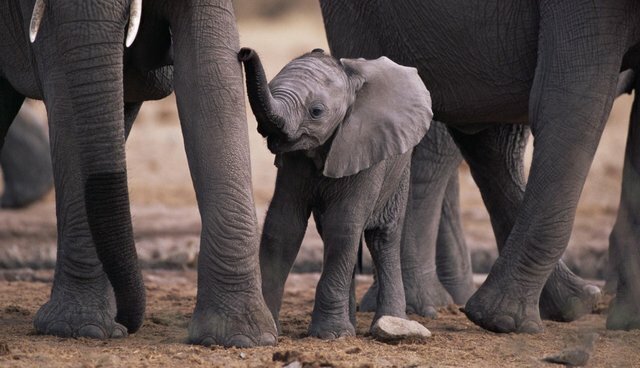 While fewer elephants were being lost, however, the traumatized herd remained reluctant to reproduce -- between 2010 and 2013, only five offspring were produced. But just weeks ago, a survey of the park's elephants uncovered something remarkable -- twenty-one new calves, representing a significant turning-point for the once-dwindling herd. Park manager Rian Labuschagne says the sudden baby boom marks a transition from a "stabilized" population to one showing a "definite increase in numbers." And though full-recovery, back into the hundreds of thousands from decades ago, may take generations, with any luck this will be the beginning.